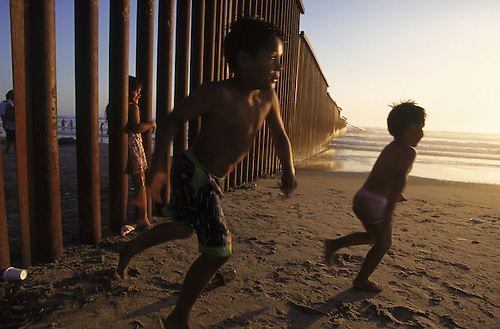 Children playing at US/Mexico border fence. Lord have mercy on my soul, because I’m about to say something that I might really regret: Ahem, cough, cough, aahhhemmmm……Is this thing on? Okay, here we go…..Folks, I agree with Rick Perry! There, I said it. Felt like I was spittin’ up a Penn Station rat, but I got it out. As governor of the over-sized hat state where the word vegan means “kill the SOB,” Governor Perry has in the past broken with core GOP values and voted to allow the children of undocumented immigrants to pay in-state college tuition. Further, he’s gone on record to state that a fence along the entire US/Mexico border is not the way to go. These are BIG issues in the BIG state of Texas, issues that can derail a presidential run or solidify the governor as a front runner with Tea Party backing. So what’s the big deal? He’s on record at a recent debate as saying that those who don’t support in-state tuition for undocumented children (who, by no fault of their own, were brought here as young children) are heartless. The big deal is that Rick Perry is facing the increased scrutiny with not-so-subtle inferences from Iowans and other potato-eatin’, red blooded Americans that he won’t get their vote unless he panders to the Tea Party platform on these issues. What’s a candidate to do? That’s the million dollar question. Will Rick Perry stand his ground as a good, old boy with strong backbone and defy those who don’t have a border in their state. Or will he pander to the right, flex his weak spine, give in and change his stance to get the votes? In other words, is Gov Perry willing to stand for what he believes and lose the election or pander for votes to win? Viewed from another perspective, do Texans prefer no-backbone, vote pandering politicians or a man with fortitude to stand by his convictions?